T-2 Extension Tubes enable you to securely set or vary the spacing between T-2 components. This # T2-25C # 1508155 T-thread extension or spacer tube provides 7.5mm of extension. It features an internal T-2 thread (M42x0.75) at one end and an external T-2 thread at the opposite end. Full internal threading and blackening kills any stray light reflections. Maximum diameter = 47.5mm. 4.9 (Based on 16 Reviews) 100% of reviewers recommended this product. This is a great place to buy astronomy gear. Fast shipping, never a problem with these folks.I always look here first for adapters and the like. Well made and a great price! I have been buying Baader accessories for many years and I have always found them to be of superior quality to others on the market. I know that if I buy a Baader accessory it will be much more than just satisfactory. Solid quality as we have come to expect from Baader and their T2 systems. 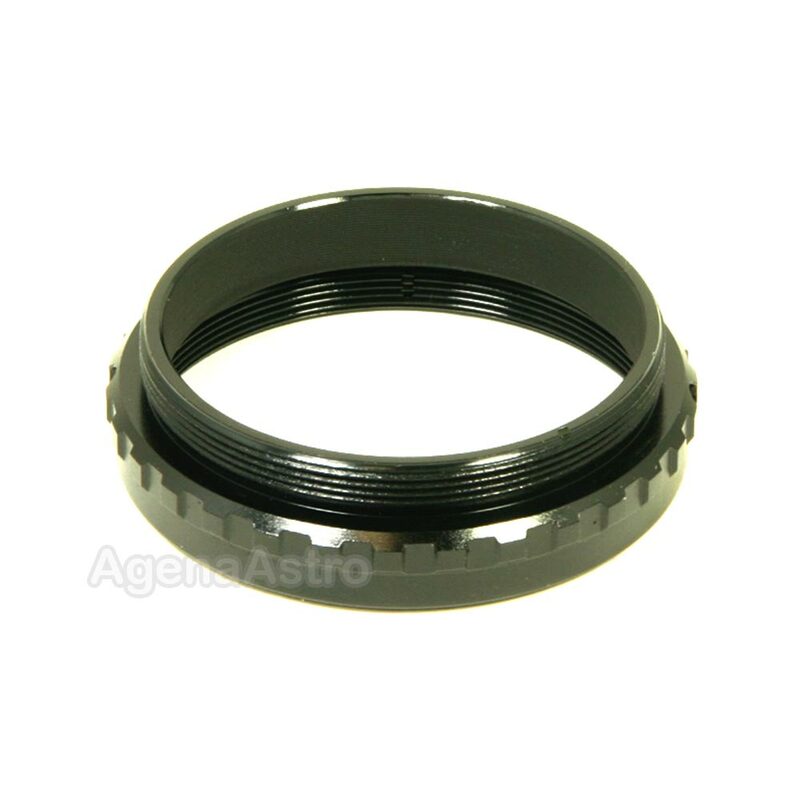 This extension was required to add height to the 29mm Baader Budget 1.25" eyepiece holder. Certain eyepieces, most notably the Nagler 2-4 Zoom, have such long barrels that they contact the prism surface of the T2 Baader Zeiss prism diagonal part when used with that Baader EP holder. Investing in rings, Change Locks and extension tubes can save you a lot of money on more eyepieces by varying your magnification intervals with a 1.25x, 2x or 3x barlow lens...in fact I only use one pair of excellent 25mm Zeiss eyepieces. Afocal projection for my revolution imager was easy with the purchase of this adapter, the /T-2 Budget Eyepiece Holder, and the T-Adapter HTA43/T2. Just screwed them on top of my Hyperion 17mm and popped in the video camera. Worked great for showing moon images at a star party. Real fine product. fit my product good and works well. Review by Jan of Sun City West, AZ. I use several of these spacers (in two lengths) to achieve the proper back focus on one of my SCTs, in conjunction with a reducer/corrector. This, and the shorter spacer, working together, allowed me to achieve exactly the back focus I needed, and the total system works perfectly. Doesn't get any better than that. Review by Jan of Northwest of Phoenix, AZ. Review by Astrojock of Calgary Alberta Canada. Nice for adjusting spacing between the Lunt Solar scope blocking filter T thread and the camera sensor. Review by Big Ugly Guy of Tucson, AZ. This is a basic, no frill item that provides the correct spacing for your T thread imaging train. The connections are solid and well machined. Although simple, these spacers have a very good "Bang for the buck". If you need this type of spacer, look no further. Review by peeech of North Augusta, SC. This is a common product. I like Baader products for their quality.